The Midnight Review: Big Government Freaks Want To Bar Certain Places From Acting As Polling Places... But Churches Are Okay. Big Government Freaks Want To Bar Certain Places From Acting As Polling Places... But Churches Are Okay. A couple of days ago I posted a comment on Big Government to an article by Ryan P. Dixon that questioned whether or not "politically active" organizations should be used as polling places. Dixon primarily focused on union halls. I had simply asked if churches should be held to the same standards Dixon wants for union halls and that is when the hypocrisy floodgates opened. Dixon quickly started to redefine what he meant, exempting churches because "churches don't contribute money to candidates." I quickly pointed to the backing by The Church of Jesus Christ of Latter-day Saints of California's Proposition 8 two years ago, in which the vote limited marriage to being defined as a union between a man and a woman. My comments quickly uncovered the agenda of the religious right. I was told that churches are in the business of morals and it was their duty to get involved, and campaigning for issues is different then campaigning for candidates even though Dixon originally asked if "politically active" places should be used as polling places. 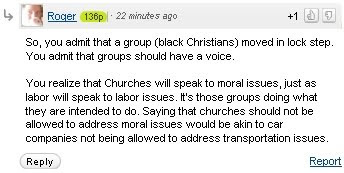 One commenter in particular had tried to catch me in some sort of "gotcha" moment by asking me why I kept ignoring the black churches that opposed Prop 8 in addition to the LDS. They also tried other "gotcha" questions, referencing McCain-Feingold, the Constitution, and even the political activity of teachers unions. Lets take a look at Roger's comments. First he references the recent overturning of parts of the McCain-Feingold Act but he conveniently leaves out the facts that the part prohibiting the direct contribution to candidates from corporations or unions is still in place, placing unions in the same boat as churches. 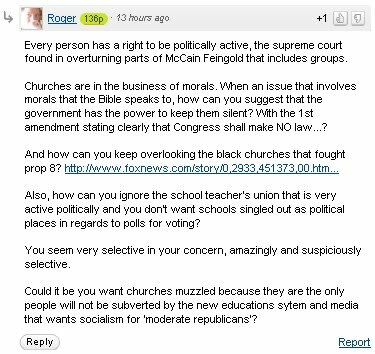 Using Roger's logic that barring churches from acting as polling places is infringing on their free exercise of their faith, then one would also have to accept both clauses - that allowing them to act as a polling place equates to the government "respecting an establishment of religion," which of course violates the constitution. Thirdly, Roger again referenced the black churches, citing a Fox News article by Greg Gutfeld, in which Gutfeld reasoning behind why people did not protest lack churches was because protesting blacks would be "scary." Why statistically, black churches may have supported the Proposition 8, there is no actual church hierarchy like the Mormons. There is no black pope unifying every black church against the amendment. Essentially, each black church can differ from the next. Roger's reference of the Gutfeld article shows a desire to use racial tensions as a bargaining chip. Why would Roger continue to insist that I reference the black churches despite the fact that I was only proving a point that churches are "politically active" organizations? Was it to try to paint my comments as racist? Fourthly, Roger references "politically active" teachers unions as an attempt to discredit the usage of public schools as polling places. First, Roger is assuming that I want to bar churches but not schools. He is wrong. I have no problem allowing churches, union halls, public libraries, country clubs, schools, etc. acting as a polling place. What is Roger afraid of? A bunch of teachers with rulers threatening his life unless he votes for their candidate? I love how Roger makes the obligatory right-wing socialism comment too.